Nuance more than lives up to its joyous promise of being quick, capable and fun. Ease of use. Excellent modulation options. Inspiring. Minor issues with zones not triggering (due to be resolved). For most producers, mega-samplers like NI Kontakt and MOTU MachFive deliver far more power than is actually required for the majority of their sampling needs. Often, all you want is the ability to quickly load up a few samples, throw a filter on top and maybe hook up an envelope or LFO - and that's where Nuance hopes to step in. 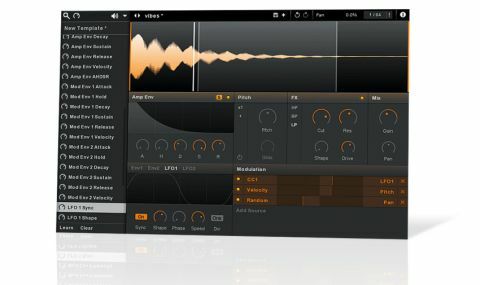 "Nuance is a streamlined sampler with a well realised featureset that puts the emphasis on workflow and ease of use"
Nuance is a streamlined sampler (VST on PC, AU on Mac, standalone on both) with a well realised featureset that puts the emphasis on workflow and ease of use. It can load WAV, AIF and SFZ files, and saves patches out in its own file format with the option to embed the referenced samples. Samples are dragged directly into the interface, where looping and keymapping are done graphically, by moving and resizing zones and loop ranges. We did have minor issues with resized zones not always triggering at certain velocities, but the developer assures us this is fixed in the next update, which should be available by the time you read this. Glitches aside, the mapping system is intuitive and quick, with no limit on the number of zones and the abililty to overlap zones (albeit without any sort of crossfading). The minimalist effects section hosts a multimode resonant filter (high-, low- and band-pass) as well as one-knob compression and distortion processors. Up to eight unison voices can activated, and the legato glide time is adjustable. It's perhaps in the modulation department that Nuance most impresses, however, with three velocity-sensitive AHD/AHDSR envelopes (one hardwired to the amp) and two LFOs onboard. Sources (which, ingeniously, include Unison) are linked to targets in a simple modulation matrix. Nuance sounds great, with the filter packing plenty of bite and the modulation system inspiring all manner of crazy sample-mangling japery. Fuss-free sampling indeed.